I trust everybody has had an eventful week. We have been kept on our toes each and every day as the sightings this week went through the roof. To start with the rarities a pack of fourteen wild dogs have been highly active around Leopard Mountain, hunting impala and Nyala and bonding in their playful manner in sight from the lodge itself. 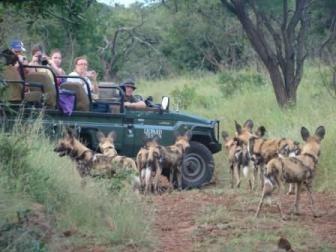 The pack ventured close enough to the vehicles for everyone to leave with some amazing photographs and an unforgettable experience. On one occasion the dogs were chasing a herd of wildebeest and ran right into the path of a very unimpressed black rhino, which in turn charged and snorted his way through the pack sending them running in all directions. Sticking with the predators our lions have been spotted relaxing on the banks of the Msunduze River; and a beautiful male Cheetah was seen scent marking all the way to a large dam for a drink. Breeding herds of buffalo have been taking advantage of the abundance of grass as we reach the peak of summer. Some interesting moments this week have included Black-backed Jackal sightings, a new member joining our pod of hippos and a wealth of little critters from Genets and Bushbabies to Scrubhares and Slender Mongoose. Our birding highlight of the week was a Black Coucal spotted by one of our rangers on drive. 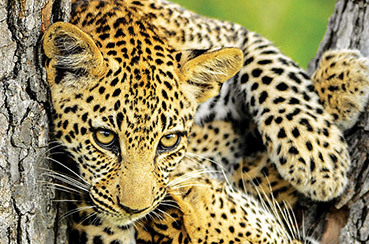 That’s it for now; from all of us at Leopard Mountain have a lovely week.